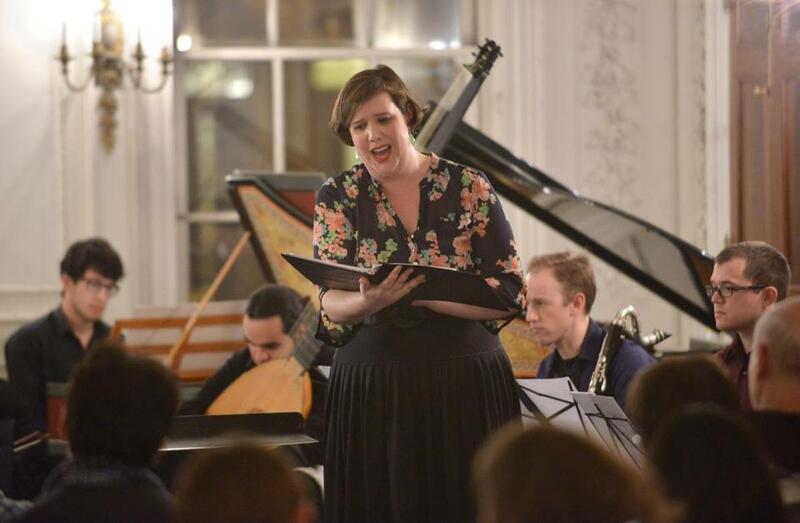 Among those performing with Cantata Profana on Thursday night was alto Sara Couden. From left: David Perry on bass clarinet, Stuart Breczinski on English horn, and Isabel Lepanto Gleicher on bass flute. One tends to hear more about “the anxiety of influence” than about its opposite, perhaps in part because we lack an equally catchy phrase. The pleasures of patrimony? The past as palimpsest? Neither of these will quite do, but you get the idea. Whatever one calls it, this was the thoughtful organizing theme behind an appealing program on Thursday night at the Goethe-Institut, titled with its own gesture of wordplay: “Re.i.ma.dri.gals,” or in short, new music responding to earlier music. 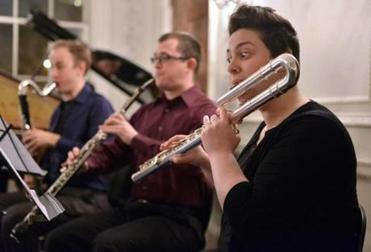 The night marked the Boston debut of a young and ambitious New Haven-based ensemble called Cantata Profana, whose programs creatively juxtapose contemporary fare with music of previous centuries. In this case three of the selections refracted older vocal works (or genres) through modern sensibilities. The Italian avant-garde composer Salvatore Sciarrino was hardly the first to eye with interest the extraordinary music and lurid life of Carlo Gesualdo, the 16th-century composer known for madrigals and murder. Sciarrino was in fact working on his own Gesualdo-based opera when he learned of one already underway by Alfred Schnittke. He changed course, but retained his Gesualdo interests, funneling them into “Le Voci Sottovetro,” selections from which dotted Thursday’s program. The wonder of these Gesualdo arrangements comes in how Sciarrino manages to be both touchingly respectful and marvelously free with his material. Gesualdo’s music — for instance, in the famous “Moro, Lasso” — is here prismatically distributed across a mixed chamber ensemble with solo mezzo-soprano voice. In the process Sciarrino splices his own timbral sensibilities into the DNA of this ravishing ancient music. Similar if less revelatory feats were on view in Aribert Reimann’s arrangements of Brahms’s “Ophelia Lieder” for string quartet and voice. That the madrigal tradition itself can be abstracted and radically reimagined without losing the resonance of its past was also deftly demonstrated with the inclusion of George Crumb’s modern Madrigals (Book I, from 1965), for soprano, vibraphone, and double bass. In these striking settings of brief excerpts from Lorca’s poetry, Crumb ingeniously pools the resources of his musicians to build a kind of super-instrument with, for instance, the human voice radiating from deep within the vibraphone’s sonic cloud, or the percussionist’s mallets deployed on the strings of the double bass. The results, as shown here, are haunting in their intensity and spectral beauty. The heart of the madrigal tradition was represented by Monteverdi’s “Tempro la Cetra,” and the group had also planned the composer’s “Il Combattimento di Tancredi e Clorinda” before a personnel change forced a switch, in this case, to a rarely spotted gem of a French Baroque cantata: “La Mort de Didon,” by Michel Pignolet de Monteclair. Performances throughout the night — by violinist Jacob Ashworth, soprano Jessica Petrus, and alto Sara Couden, among many others — were exacting and sensitive, and the group as a whole made toggling between the two niche genres of early music and new music seem as straightforward as switching bows. (It’s not.) What would have added to the mix was either a program essay or spoken comments from the stage reflecting, even just briefly, on the suggestive ideas behind this grouping of works. But the scaffolding that lets a wider audience join the adventure is the easy part, once you have the ideas themselves, and the ability to realize them as vividly as Cantata Profana did in what will hopefully be the first Boston visit of many.